Inder Loves Folk Art: Omie's cousin. I found another cousin of Omie's! This is Leo, another Vick pit bull, who was rehabilitated by Our Pack, Inc., a pit bull rescue group based in the South Bay (Los Gatos, to be precise). "PACK" stands for Pit Bull Advocates for Compassion and Kindness. Leo has been certified as a therapy dog, so here he is being loved on in his little therapy outfit. Who better to provide therapy than a dog who has survived so much? Just reading about these dogs is therapeutic. 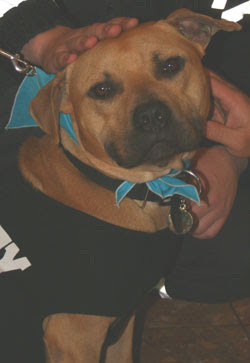 Of course, I think that little brown pit bulls with dark snouts and "eyeliner" are the cutest possible "make" of dog. Not that I'm biased or anything. I love Our Pack's motto - "Pit Bulls are for Lovers!"